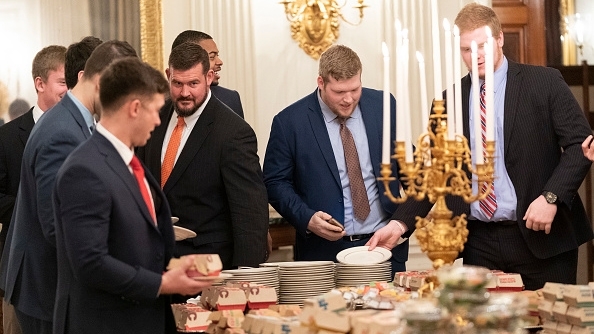 Chefs, rappers and celebrities are set on showing Trump "what an actual celebration dinner should be," after he served a spread of fast food to the NCAA college football national champion Clemson Tigers at the White House on Monday. (NEW YORK) — Chefs, rappers and celebrities are set on showing President Donald Trump “what an actual celebration dinner should be,” after he served a spread of McDonald’s Big Macs, Domino’s Pizza, fries and more to the NCAA college football national champion Clemson Tigers at the White House on Monday. Trump called the dinner “great American food,” but Nick Kokonas, the co-owner of Alinea — the only Chicago restaurant with three Michelin stars and No. 34 on the World’s 50 Best Restaurants list — thinks otherwise. While Kokonas said he could “care less” about college football, he invited the Clemson Tigers to Chicago over Twitter to eat at his restaurant, where one meal can go for hundreds of dollars. Trevor Lawrence, the Tigers’ quarterback who called the trip to the White House “awesome” on Twitter, responded to Quavo’s tweet with two “mind-blown” emojis. Good Morning America‘s Michael Strahan invited the team to join the show for lobster, and maybe some caviar too.